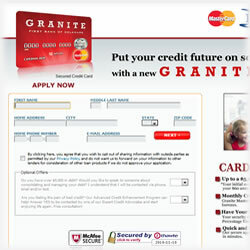 - Why Choose the Granite MasterCard? - Do You Have Bad Credit History? If you apply for the Granite secured MasterCard then you will really be able to keep your financial future stable. The card has a major advantage in that you can your credit reported to major Credit Agencies every month. By having a credit statement each month you will be able to keep track of what you are spending on your card at all times and know what is in your account at all times. Ensure that you read reviews and research this card to find out if it is right for you. One of the inherent problems you always get with a credit card is that it can affect your credit history in an adverse way. This is especially true if you do not keep up with payments or just pay the minimum amount each month. However credit must start somewhere and this card offers consumers an excellent starting place. If you are a consumer that has no credit or credit problems in the past then you should definitely consider applying for a secured credit card. This particular card requires a security deposit when you open the account. This is for security purposes when you open the account. Depending on how much of a deposit you put down and also you credit history, you will be given as certain amount of line of credit. Why Choose the Granite MasterCard? This Granite MasterCard is offered by the Delaware First Bank. As credit cards go it offers a very reasonable APR for this type of credit. The annual fee is not too high for this card. The difference between this secured card and others is that the annual fee that is charged is taken off of the line of credit straight after opening up your account. Most other credit cards of this type will just charge you without deduction from your initial credit. By doing it this way you can get your annual charge out the way right from the start and not worry about it after that. By applying for this Granite MasterCard you have to put down a deposit for security purposes. However, this deposit doesn’t just sit there doing nothing. Your money will be put into a savings account which means that your deposit actually earns interest while it is in there for the duration of the time with the credit card. So whatever you place down as the deposit will earn interest annually. You must maintain a $300 balance in your account to earn the 1.01% Annual Percentage Yield which is the APY as of November 19, 2010. This is a very attractive element of this particular credit card that you can own. As you make your payment each month or not then this will be reported to the 3 Main Credit Bureaus. Of course you will need to have paid your outstanding amount on time. Most people find it hard to open up an account with anyone if they have a bad history when it comes to recent loans and cards that may not have been paid on time. With this new secured credit card then it is possible to open up an account despite what your history is. Not all cards accept people with bad credit. However, this particular credit card differs from that route believing that everyone has to start somewhere. In today’s economic climate it is important to have available credit just in case you need some emergency funds. If you have no credit history or a history that has not been the best in the past then you should seriously consider the Granite Secured MasterCard. Great site. A lot of useful information here. I’m sending it to my friends! An impressive share, I simply given this onto a colleague who was doing a little analysis on this. And he the truth is purchased me breakfast because I found it for him.. smile. So let me reword that: Thnx for the deal with! However yeah Thnkx for spending the time to debate this, I really feel strongly about it and love studying extra on this topic. If possible, as you turn out to be expertise, would you mind updating your weblog with extra particulars? It’s extremely useful for me. Large thumb up for this weblog post on Granite Secured card!